How to Buy and Maintain a Carpet: Avoid Losing a Fortune When Buying a Carpet! Synopsis: Reviews: Both the present and past president of the California Carpet Cleaning Institute have endorsed this book. Ralph Nader's Cal-Perg organization recommended this book. Robert Selby's Bio: Robert Selby has owned a carpet installing and cleaning business for over 14 years. He conducts classes in the care and treatment of carpets as well. He has bought, installed and cleaned almost every type of carpet there is. This book is a quick summary of his experience and advice. Author Comments: Carpeting in the average home is the third most expensive investment that the average homeowner undertakes. This book is designed to save you from making expensive mistakes in your carpeting decisions. Written by an expert in the industry, this book tells you how carpets are made and how you can avoid making big purchasing mistakes and how to care for the carpet once you get it. 3. How to Buy and Maintain a Carpet : Avoid Losing a Fortune When Buying a Carpet! 9. 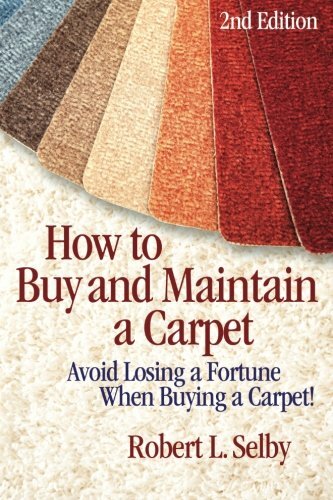 How to Buy and Maintain a Carpet: Avoid Losing a Fortune When Buying a Carpet!